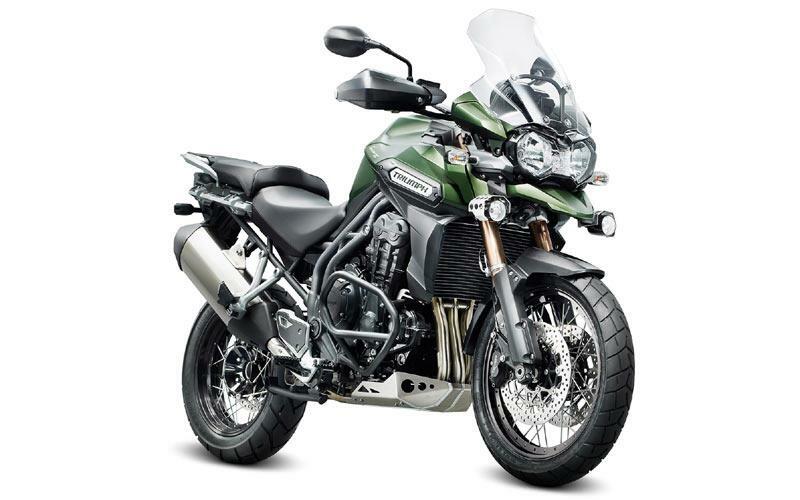 This is Triumph’s new XC version of its Explorer 1200 – the surprise unveiling and one of the highlights of the weekend’s Triumph Live at Mallory Park. Built as a more, rugged, off-road orientated version of the Explorer (in a similar way to its smaller Tiger 800 and Tiger 800 XC double act) and undoubtedly aimed squarely at BMW’s R1200GS Adventure, the XC gets alloy-rimmed wire wheels, hand guards, fog lights, crash bars and a sturdy looking aluminium bash plate, along with a new khaki green colour scheme, but otherwise boasts a similar spec to the Explorer 1200. At its heart is the same 1215cc shaft drive triple, producing 135bhp with 89ftlbs of torque. It’s also equipped with ride by wire throttle, cruise control, traction control and switchable ABS. The new XC will receive its full public debut at Intermot in Germany in October followed by the NEC show and is expected in dealers next March. No price details have been revealed but if the new XC follows the model of its 800 siblings expect a premium of around £600 over the standard model taking it to £11,799.